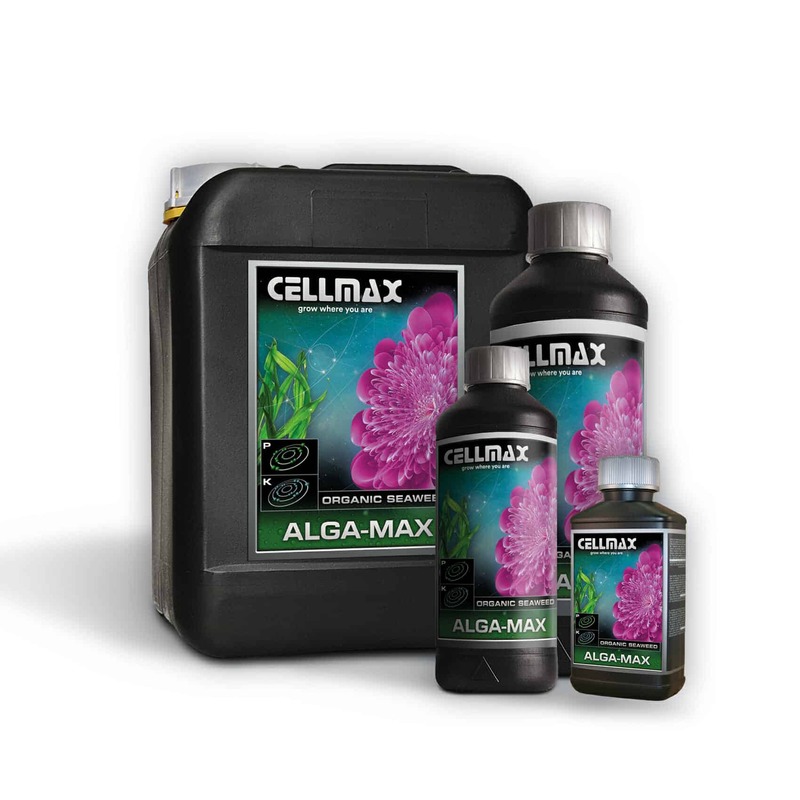 Cellmax Alga-Max is a perfectly balanced organic booster for annual flowering and fruitbearing crops. Alga-Max is a product based on freshly milled sea-algea. As result, Alga-Max contains bio-active substances of natural origin. This product is also rich in plant absorbable phosphate and potassium. Feeding your plants with Cellmax Alga-Max ensures healthier plants with an exuberant flowering and rich fruit formation. It also strengthens the moisture balance of the plant, improves bud formation and reduces the effects of abiotic stress. Application: Apply to plants in the flowering phase for 1-4 times per week until two weeks before harvest. (1:1000) 1 ml to 1 liter of water. This product is suitable for automatic irrigation systems and has been successfully tested for use in potting soil. Directions for use: shake well before use. Dilution ratio (1:1000) 1 ml to 1 liter of water. Alga-Max is plant based and suitable for any growing style and medium. Guideline: Apply to plants in the blooming phase for 1-5 times per week until two weeks before harvest. Usage: Shake well before use. Do not keep nutrient solution for longer than 4-7 days. Do not use this product with hydrogen peroxide. Storage: Keep bottle closed in a cool, dark and frost-free place. Keep away from children. The Algamax is the single best bloom booster I have ever used. And I don’t say this lightly! The proof is in the pudding and man have I got some awesome results using this stuff! This product has given me the best tasting, best looking most resinous covered flowers I’ve ever grown, I cannot see myself using anything else anytime soon.